“Beautiful Mess” will feature the same acoustic vibe Branden’s fans have come to know and love. As for “Limitless,” people can expect to discover another side of Braden that continues to tell honest stories, but explores new and bigger sounds. Both albums are available for preorder right now, and 5% off all sales will be donated to To Write Love on Her Arms to help raise awareness for suicide prevention, a cause close to Braden’s heart. Support Braden’s project & TWLOHA here. We had the honor of chatting with Braden about his journey, the new project, and why mental health is important to him. Check it out below. TWLOHA: Can you tell us a little bit about yourself and your upcoming project? BRADEN: I’m Braden. I grew up in a small town in Ontario, Canada. I started creating music back in 2009 because it was seriously the only thing that made sense to me and helped me get through those years. I’ve been blessed with the opportunity to share it with a ton of people and play shows over the last ten years. Right now I’m just in a place where I’m naturally feeling growth… and I want to try something new. That’s why I’m releasing two albums this year instead of just one. I definitely lost touch with myself a little bit back in 2016, and writing these songs has really helped me find my purpose again. I’m so excited to share this stuff with my listeners, and for them to know that they are a massive part of the actual manifestation of the vision. TWLOHA: What inspired you to collaborate with To Write Love on Her Arms? BRADEN: I’ve always written about the emotions I feel, many of which can be dark. I learned pretty quickly that the reason so many kids were connecting with my stuff was the fact that they could relate to what I was writing about, and were experiencing it as well. I know depression, anxiety, mental illness, etc. has affected a huge percentage of the people who listen to my music, so I always try to do my part in bringing light to it and reminding everyone that literally every human goes through it sometimes. So that’s why I immediately thought about TWLOHA for this campaign. I know for a fact that TWLOHA has impacted so many of their lives in a positive way. Along with that, I’ve known about you guys since I started making music and it just made sense. I’m really honoured to be partnered up on this, and I feel that going beyond the music itself, there’s a lot of potential to bring people to a place where they know they have support available when they need it. TWLOHA: From personal experience, why do you think it’s necessary for us to talk about mental illness and challenge stigma? BRADEN: If we don’t talk about it, we are left to deal with it ourselves. 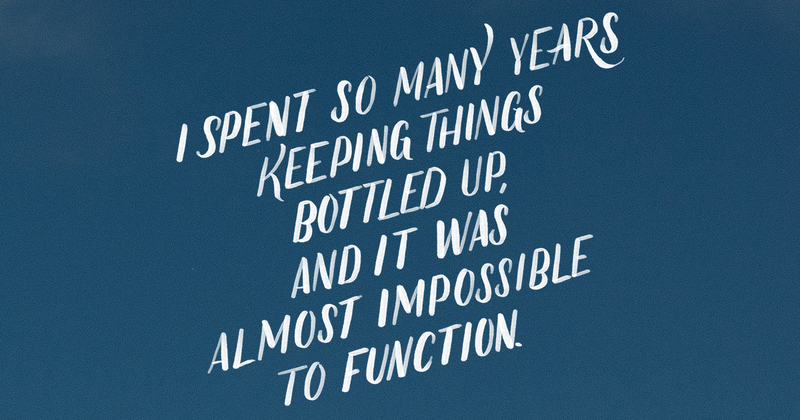 I spent so many years keeping things bottled up, and it was almost impossible to function. I know not everyone has an outlet so I think it’s incredibly important just to be constantly reminded that you’re not alone. It sounds cliche to some, but I believe it’s the truth. We are all here on this earth together for the time being, and we need to remember that. For me personally, being able to play shows and have conversations with people about the heavier aspects of life, helped ME realize that I wasn’t by myself. That only happened through communication, and I’m very thankful for that. TWLOHA: Instead of sticking to a single genre, why do you think it’s important for you and others to honor our many sides of expression? BRADEN: I think sometimes in life, when we start feeling something change, our natural instinct is to push against it because it’s unknown and unfamiliar. But change is necessary for growth, even in nature itself. I started to feel like I needed to tap into other emotions that I haven’t been able to express yet. Creating electronic music has allowed me to uncover new pieces of myself that I want to share with others. It’s a way for me to create movement that I can’t create with an acoustic guitar. And the truth is, I love acoustic music even more now that I have that contrast to bounce back and forth with. I think every artist needs to flow with what feels right… and trust the process. Even if you try something and it doesn’t feel right in a year, at least you tried it and now you know. I just want to make music that I love, and that’s what I’m focusing on doing with these albums. TWLOHA: Has music always been a way for you to channel your emotions or did creating music allow you to delve deeper? BRADEN: Even before I started actually creating my own music, it was always my escape. The first band that REALLY made me feel something was Underoath. It was the first time I cried from something other than sadness. I still vividly remember that moment because I realized there was so much more depth to myself than I thought. So naturally I wanted to explore it more, and I think that’s really why I started to write my own songs. I was able to spend time wording things that I couldn’t do in conversation, and use metaphors to try and explain things that can’t really be explained. There’s an entire world buried beneath our thoughts and I just always want to help bring others to that place, even for a moment. Sometimes when I listen to something I’ve written a few years after releasing it, I understand something about myself or what I was going through that I wasn’t able to see before. TWLOHA: The Vans Warped Tour has played a significant role in TWLOHA’s 12-year journey, what’s your favorite memory from Warped Tour as performer? BRADEN: Honestly the entire tour was the best memory of my life. But I think my favourite moment was back in 2015 when I played in Toronto, which was essentially my hometown show. All of my friends and family were there, and it just reminded me that I was on the right path. It was just so cool to be on a tour that I dreamed of ever since I started making music… and see all of the people that helped me get there right in front of me.